Gimp 2.8 Save/Export new behavior is far to be popular according to the gimp-development mailing list of this month or various feedback I had after my tweet about it. I try here to write a bit about it, and deliver some thoughts and proposition ... And even an immediate workaround solution. Personnaly, I never really was a fan of this new behavior. That said, it's not a big deal and I can live with it easily. It's less ergonomic for my digital painting workflow within Mypaint<>Krita<>Gimp via the *.ora (open raster files) as it was before into 2.6. The behavior is just different and non consistent with my other softwares. I can't 'save' an *.ora anymore, I have to export. It's confusing because I use the 'save' button for it in my 2 other digital painting applications. Just minor lost of time figuring my way on the Save/Export panel and brain gymnastic to remember I should behave differently now in Gimp. It can be even surprising to hear me say that, but I like some aspect of this behavior and understand the choice of the Gimp development and respect it. New users aren't supposed to know all the files format, and guiding them to a single file format where all the working data are safe is a strong and right proposition of design. I teach digital art in school and workshops, and this user error trying to save all the layer of a magazine cover inside a *.jpg is very common. Avoiding that is something good. I also had a very good time with 2.8 when I contributed to re-texture a map of the open source game Nexuiz, as well as when I had to perform webdesign task (header, buttons, background). Its really cool to get the software protecting your source file, and an export file type and path the software remember for each source file. I could re-open very fast my sources *.xcf , and export to the texture *.tga, or the web *.jpg. It's a real boost of workflow into a project Gimp-centric. So, the design is good, and make sens. In fact; the problem appears only for user like me using another source file in the workflow. Using Gimp into an ecosystem of software? thats not part of the software design; Gimp is made to be Gimp-centric in a way and thought this way. And this move of the designer proove this point and this perspective quite well. Well, it could works if Gimp was as awesome as Mypaint and Krita for digital painting and was the dominant leading graphic application of free software; but thats not the case (anymore?). A solution would be to convince Mypaint and Krita to adopt the same design (split Export and Save) and work around the same XCF file specification? Sure... ultimate solution! After all, *.xcf is an open file format, has all layers, blending mode, vector, text, etc... and I would be happy to have a unified workflow. But in reality, no one have time for unifying things. Convincing Gimp developpers to add *.ora as a source file like *.xcf? I guess they would reply 'no' because *.ora can't store for the moment Gimp 's vector path, text data, mask, etc... Too bad; 2 years ago I was really believing each actor of libre graphic softwares would work together and get an open raster file format for storing the source. So the situation is freezing, everyone do their own standard in their corner... and I guess things will not move before long. Edit 2019: I'm rereading during a maintainance of the website, we are 7 year after I wrote this and things are still e-x-a-c-t-l-y the same. Even worst I would say. My actual solution is the Save/Export Clean Plugin of Akanna. A little Python script to download and put under your folder /home/<username>/.gimp-2.8/plug-ins and mark it as executable. With the Edit > Keyboard shortcuts , I can attribute it Ctrl+S, and I attribute Ctrl+Maj+S to 'Export to'. Thats all, now things work as before for me, because I'm using mostly keyboard shortcut. Gimp doesn't warn me on closing because I didn't saved my file as *.xcf. This workaround doesn't use the default 'overwrite' entry to map to Ctrl+S (as proposed into this article), because after a single 'overwrite' the option in the menu disappear and let 'Export' replace it, and this one needs a new shortcut. I dislike this. 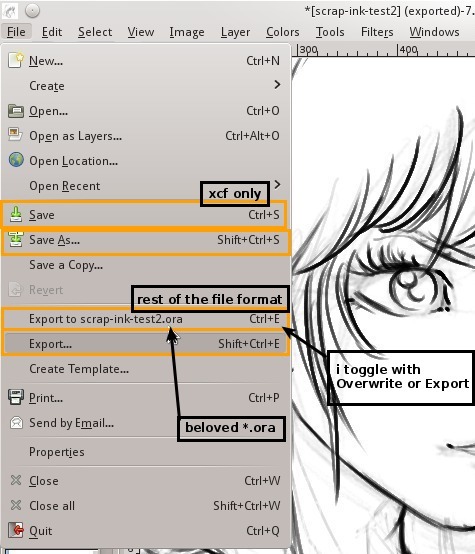 Other problem; Gimp can't export to *.xcf, so, I can't with my shortcut do an export for a xcf files. You can't export a XCF in Gimp ... c'mon , you really want I close now the save dialog after choosing a path and a filename to redo it ? License: CC-BY David Revoy, www.davidrevoy.com, 19 november 2012 . @Alexandre : Hey , yes, that's sad for OpenRaster. Btw, about file format for archiving , I also really liked *.xcf.bz. Very good way to have all data + mini sources files + thumbnail preview in file explorer. For saving the reassigning of shortcuts worked well, but I have a problem with actualisation of the painting. The "Revert"-function seems only to work for .xcf or am I doing something wrong? At the moment it seems to be strenuous to work simultanously with GIMP and MyPaint. In MyPaint I only need to press F5 for an update. In GIMP I have to load the painting once more. Do you have any tips how to handle this? Tempted about Linux ? For Windows user ; my advice is still Linux Mint , 'Cinnamon' edition or KDE. I use KDE here. The softer way to learn in my opinion , is If you have an old machine or a laptop you can dedicate to play with it :) But the most important is to be comfortable in the Os doing tasks. Thanks for this info, a big help! I was just reading through the bugzilla reports on the GIMP brush outliner, I have the same problem with the brush outline being stuck behind the stroke and I'd like to resolve this, would it be possible for you to write up a small tutorial about compiling recent builds of GIMP? I'm using Kubuntu and have been for a while (I like the performance KDE gives in painting applications.) But I'm not as savy as yourself in regardless to the more complicated task of compiling on Linux (I think a lot of us are the same in that regards.) And I really apperciate the work you do for the FLOSS community, so thank you! Thanks again David for your efforts and helpful response! When I'm using an .ora-file the "Revert" function remains inactive (grey) in GIMP. It's only active with .xcf... weird? It occurs to me that the gimp could check to see if the file is using unsupported features before disallowing save to ORA. I think this new save is a mistake. If user make error is a user problem. I know the difference, I want choose. I have yet to download and compile the new GIMP 2.9 but if "Save" is still broken I won't be using it either. I am content for the time being to continue with GIMP 2.6.11 and not upgrade until they return the old behaviour. If i must find something else, I will. @paul : For a good JPG in, JPG out ; you can try Krita. If you can put your hand on a 2.9.11 version , it's the last stable to the date.